Carol Elaine Channing (born January 31, 1921) is an American actress, singer, dancer, comedian, and voice artist. Notable for starring in Broadway and film musicals. Her characters typically radiate a fervent expressiveness and an easily identifiable voice, whether singing or for comedic effect. She began as a Broadway musical actress, starring in Gentlemen Prefer Blondes in 1949, and Hello, Dolly! in 1964, when she won the Tony Award for Best Actress in a Musical. She revived both roles several times throughout her career, most recently playing Dolly in 1995. Channing was nominated for her first Tony Award in 1956 for The Vamp followed by a nomination in 1961 for Show Girl. She received her fourth Tony Award nomination for the musical Lorelei in 1974. During her career, she had won or been nominated for a Tony Award for every Broadway show she ever played. 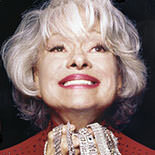 She was inducted into the American Theatre Hall of Fame in 1981 and received a Lifetime Achievement Tony Award in 1995. She continues to perform and make appearances, singing songs from her repertoire and sharing stories with fans, cabaret style. She released an autobiography titled Just Lucky I Guess in 2002 while a documentary film about her career was released in 2012, titled Larger Than Life.